(Nanowerk Spotlight) Plasmonic nanoparticles such as silver and gold allow the focusing of visible light in nanometer scale areas trough the excitation of the Localized Plasmonic Resonance (LPR): visible electromagnetic radiation induces an oscillation of the free electrons localized at the metal nanoparticles/dielectric (surrounding medium) interface. The LPR can be controlled in frequency by varying both the size and the shape of the nanoparticles and the dielectric constant of the surrounding medium1. Due to the electron-electron collisions, the localized electric field generated around the nanoparticles is converted to heat and the nanoparticles behave as nanoscale sources of heat. It is a challenge to measure the temperature variation at the surface of the nanoparticles under optical illumination since nano-localized temperature variation is the most important parameter for applications ranging from nanomedicine to photonics. In particular, the conversion of light to heat trough the exploitation of the LPR has enabled a remarkable breakthrough in fighting cancer2. Nanoparticles can be delivered to tumor cells, and the efficient conversion of Near Infrared (NIR) light to heat opens up a new 'drug-free' cancer therapy, called Plasmonic Photo-Thermal Therapy (PPTT)3. In Figure 1, blue, green and red 5 mW lasers are placed on human fingers to see how much of the light can be transmitted trough roughly 1cm of a finger. It is worth noting that the red light goes well trough the tissue while the green and blue light is absorbed by the tissue and converted to heat energy. This observation can be also confirmed by analyzing the absorption spectrum of a human hand4. Therefore, in building a bridge between biosystems and nanomaterials, it is important to keep the LPR of nanoparticles close to the water transparency window (700-900 nm), where tissue absorption is low and, thus, the penetration depth of the radiation is high. A particular class of nanoparticles are gold nanorods (GNRs) which have two (transverse and longitudinal) LPRs, tunable from visible to NIR, depending on the particle shape. Investigation of the heat transport mechanism, from the heated GNRs to their surrounding medium, is a fundamental step in realizing nano-localized sources of heat for applications in nanotechnology and thermal-based therapies. To this end, in the last few years, many techniques have been exploited such as embedding the nanoparticles in ice5, employing suspensions of nanoparticles in organic solvents6, or using a complex made of semiconductors and nanoparticles7. However, despite all the obtained results, the possibility to use reconfigurable materials has not been yet explored. Thermotropic Cholesteric Liquid Crystals (CLCs) are smart, anisotropic materials that exhibit self-organizing properties along with fluidity, and can respond to a wide variety of external perturbations (AC, DC, optical fields and pressure); indeed, the helical pitch of a CLC can be easily controlled by external fields and temperature variations. Researchers from the University of Calabria8, University of Bari9, CNR-IPCF10, BEAM Co.11 and the Air Force Research Laboratory12 have advanced a breakthrough in the monitoring nanoscale temperature variations under optical illumination by combining GNRs properties and thermotropic CLCs capabilities (see paper in Advanced Optical Materials: "Nano-Localized Heating Source for Photonics and Plasmonics"). Compared to previously employed techniques the reported method represents an innovative non-invasive tool wherein the properties of well known materials like CLCs are used for continuously monitoring photoinduced temperature variations around GNRs with high sensitivity. Cetyltrimethylammonium bromide (CTAB) capped, water dispersible GNRs have been synthesized and subsequently transferred in chloroform, in order to obtain a dispersing medium with Liquid Crystals (LCs). The Transmission Electron Microscopy image of Figure 2a indicates that the particle population consists mainly of GNRs with a 2.5 ± 0.4 aspect ratio (AR) while the normalized UV-Vis absorption spectrum of GNRs solution is shown in Figure 2b. The GNRs dispersion exhibits two typical plasmon bands: a transverse one at 520 nm and a longitudinal one at 674 nm. 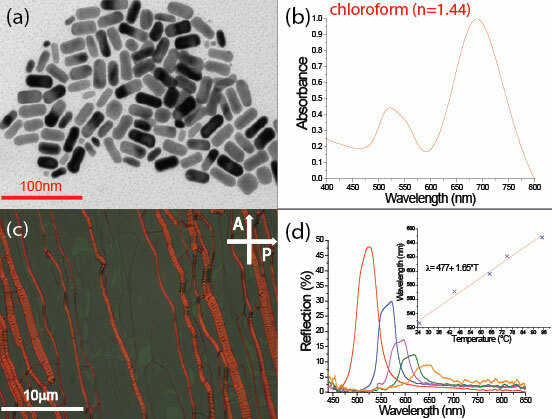 Subsequently, 100µm thick glass cells has been filled at room temperature by capillary action with a homogeneous solution of GNRs (10 wt.%) mixed with CLC (helix pitch of about 400 nm). Figure 2c is a polarized optical microscope (POM) view of a sample, where the presence of declinations is quite clear. This kind of structural defects, called 'oily streaks', appear as long bands that divide the ideal domains of the layers. However, oily streaks are markers of a lamellar phase and clearly indicate the existence of a Grandjean texture (that means CLC helices oriented perpendicular to cell surface) of the CLC configuration. We have analyzed the spectral reflection properties of the CLC configuration by probing it with a white light source under the optical illumination due to a CW NIR pump laser emitting at λ=680 nm (Ppump= 0.2 W/cm2) in the high absorption range of the GNRs (longitudinal band). Figure 2d reports the behavior of the CLC reflection band under illumination with the pump beam, for different exposure times (from 0 sec up to 75 sec). The CLC acts as a mirror for all the wavelengths within the reflection band of the impinging white light, which are back reflected. By optically pumping the same sample area, the photoexcitation of GNRs induces a conversion of light to heat; therefore, the system cool down by exchanging energy with the CLC. In Figure 2d, it is easy to observe that, by keeping constant the pump power and increasing the exposure time, due to a gradual enhancement of the local temperature, a linear red shift (more than 130 nm) and a partial suppression of the reflection band take place. The calibration curve reported in the inset of Figure 2d shows that by measuring the center wavelength (called Bragg wavelength) of the reflection band , it is possible to measure the temperature around GNRs at a given illumination time with a sensitivity of about 0.03°C. The developed method represents a new opportunity for realizing a nanomedicine tool, useful to avoid invasive treatments (e.g. hypothermic effects) on patients during therapy treatments.